You've just ushered a new baby into the world, and are working to get your brain around all that you need to pay for. Diapers. Food. Child care. College. It may be nearly two decades away, but thinking about your child's college education now can help you save lots of money for when it's finally time to foot the higher education bill. Saving for college will require a lot of discipline and patience, but you can make it happen with the right tools and knowledge. Let's take a look at some key things you need to know to send junior off to college without going broke. Let's start with an understanding that college is costly. The College Board says the budget for a moderately priced public college now is over $25,000 annually, and more than $50,000 for a private college. Prices have nearly doubled in the past decade and costs are expected to continue to rise. It's obviously impossible to know what college will cost in 18 years, but you can make reasonable projections based on current costs and the rate of inflation. Estimating the cost of college is obviously the one piece of information you need when determining how much to save. Some people dismiss community college, but that's a mistake. Community colleges are perhaps the most underrated components of the academic system. There are thousands of these great colleges that offer solid education experiences for a fraction of the price of four-year institutions. They are excellent for students who aren't quite sure what they want to study or are perhaps wary of going away to school. At community colleges, a student can often take care of many of the core requirements of a major, then transfer to a four-year institution where they can get the rest of the key coursework they need. This can ultimately save families tens of thousands of dollars. Consider community colleges when exploring future education options for your young one. Most states offer special savings plans that allow you to invest money for the purpose of saving for educational expenses. In most cases, you can withdraw the money tax-free when it's time to pay for college or qualified educational expenses. In a sense, they work like a Roth IRA, only for education. Some plans also let you deduct contributions from your taxable income. These savings plans can be powerful because you can sign up for them as soon as your child is born. And if you save aggressively over the course of 18 years, you can end up with a sizable fund, perhaps even enough to cover the cost of tuition entirely. You may wish to selflessly pump as much money as you can into your child's college savings account, choosing to worry about your retirement savings at a later time. But this is a dangerous strategy. If you choose to postpone retirement saving, you run the risk of not having enough saved to make ends meet when you stop working. And unlike college, you can't borrow money to pay for your retirement. Your child's grandparents may be eager to help with future college costs, and you may have other relatives willing to pitch in as well. You can help guide them as to the smartest way to help. In many cases, relatives may also receive immediate tax breaks by contributing to college savings plans, and they may even be able to gift money for college as a way to avoid future estate taxes. 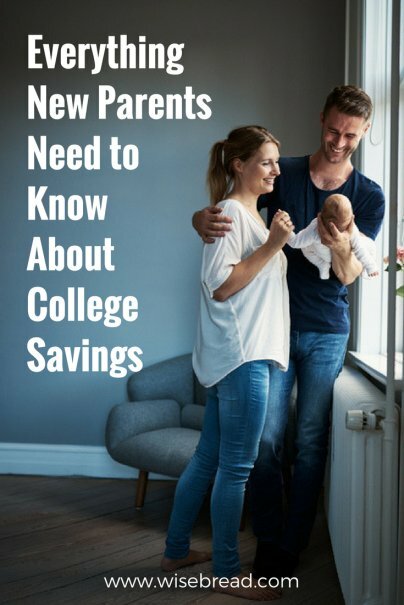 It's important to learn how your income and savings can impact the type of financial assistance that your child may receive to pay for college. To qualify for grants or federal loans when it's time for your child to attend college, you will have to fill out a Free Application for Student Aid (FAFSA) form. It may be your plan to save for college and avoid loans entirely, but there's no guarantee you won't need them, especially if costs continue to rise. Navigating the ins and outs and pros and cons of both federal and private student loans will require some research and patience. You should seek to understand the typical interest rates on college loans, and how quickly loans must be paid back. Know that student loans can't be discharged in bankruptcy and that defaulting on loans can hurt a graduate's credit score. This may seem like such a basic piece of advice it's not worth mentioning, but it's crucial when you are trying to save for your own future as well as the college costs of a child. In an ideal world, you can save aggressively for both a child's college tuition and your own retirement, but that requires a hefty sum of cash. To achieve both goals, you must be laser-focused on keeping your spending levels low, avoiding debt, and managing budgets smartly. It may require sacrifices. For many people, those sacrifices are worthwhile, but just be sure you know what they entail as you embark on this journey. Being prepared mentally and emotionally will help you stay on course.